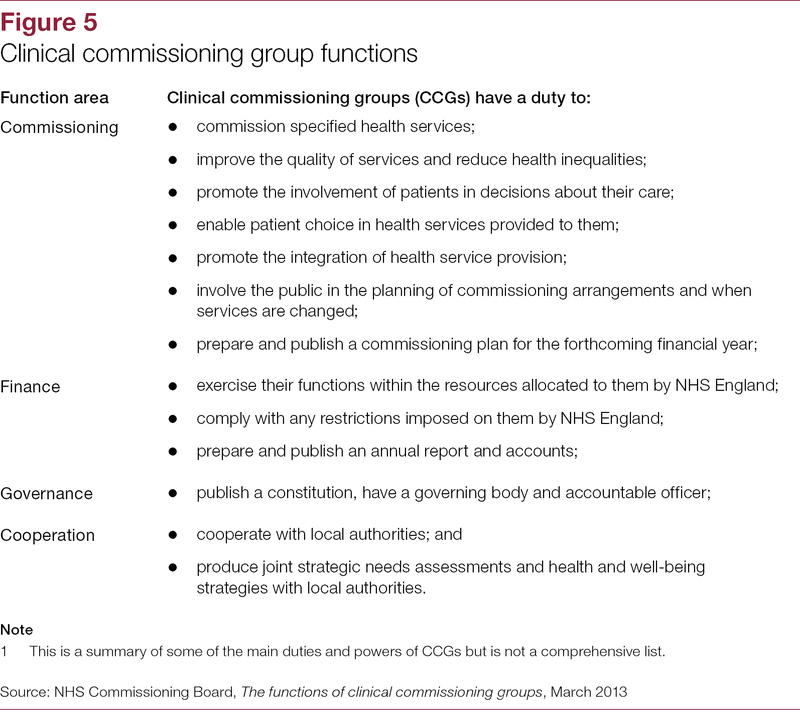 Clinical commissioning groups (CCGs) are clinically-led statutory bodies that have a legal duty to plan and commission most of the hospital and community NHS services in the local areas for which they are responsible. CCGs are led by a Governing Body made up of GPs, other clinicians including a nurse and a secondary care consultant, and lay members. 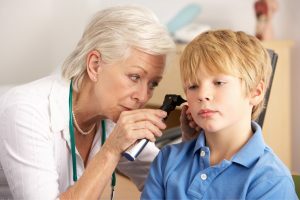 They were established as part of the Health and Social Care Act in 2012 and replaced primary care trusts on 1 April 2013. Since their formation, there have been eight formal mergers of CCGs, which have reduced their number from 211 to 195 as at April 2018. The smallest CCG (Corby) covers a population of 78,000, while the largest (Birmingham and Solihull) covers a population of 1.3 million. 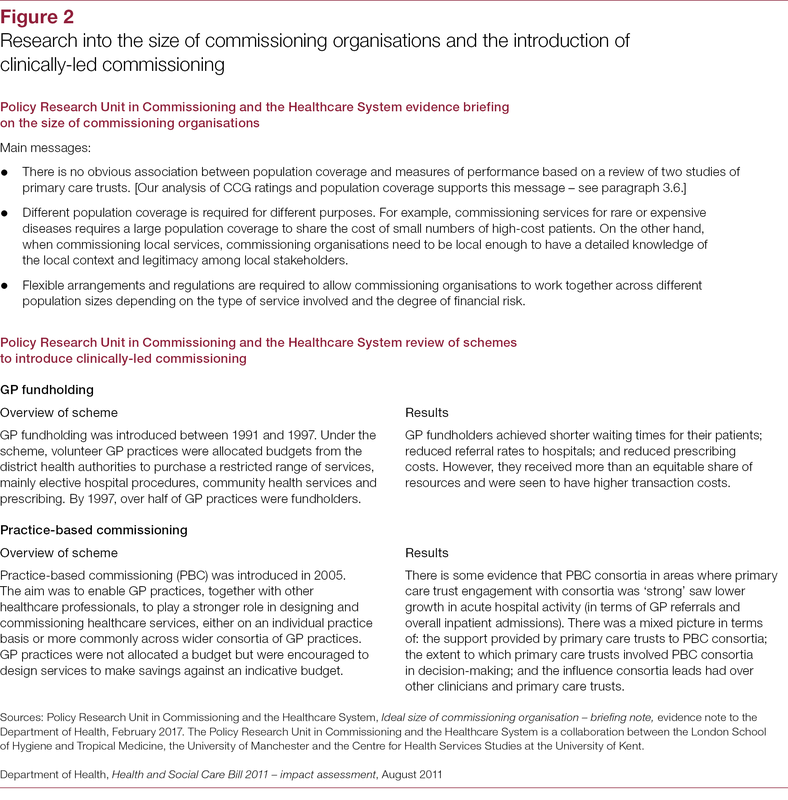 Since commissioning was introduced into the NHS in the early 1990s, there have been frequent changes to the structure of commissioning organisations. 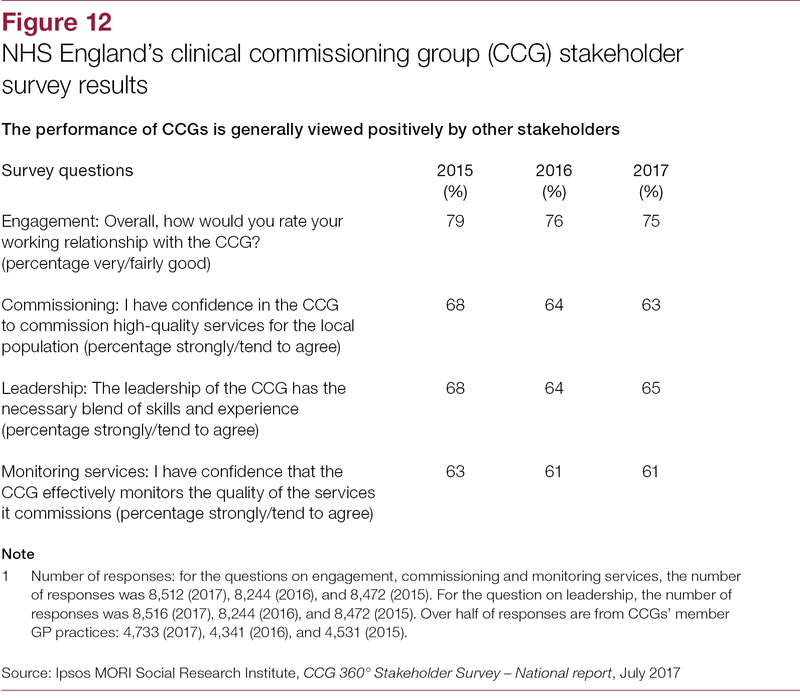 This looks set to continue, with the role of CCGs evolving as the NHS pursues a more integrated system across commissioners and providers. 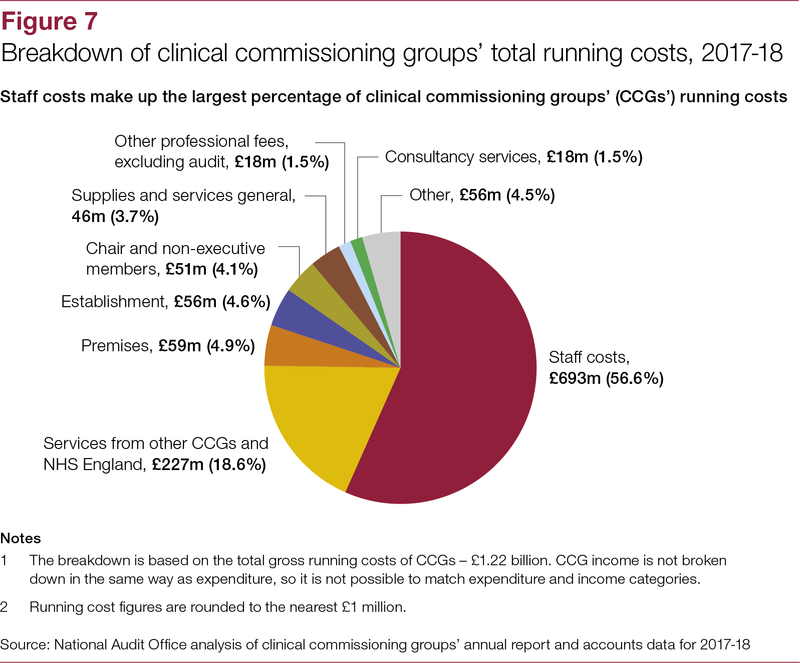 Consequently, there are likely to be more CCG mergers and increased collaborative working between CCGs and their stakeholders, for example healthcare providers and local authorities. 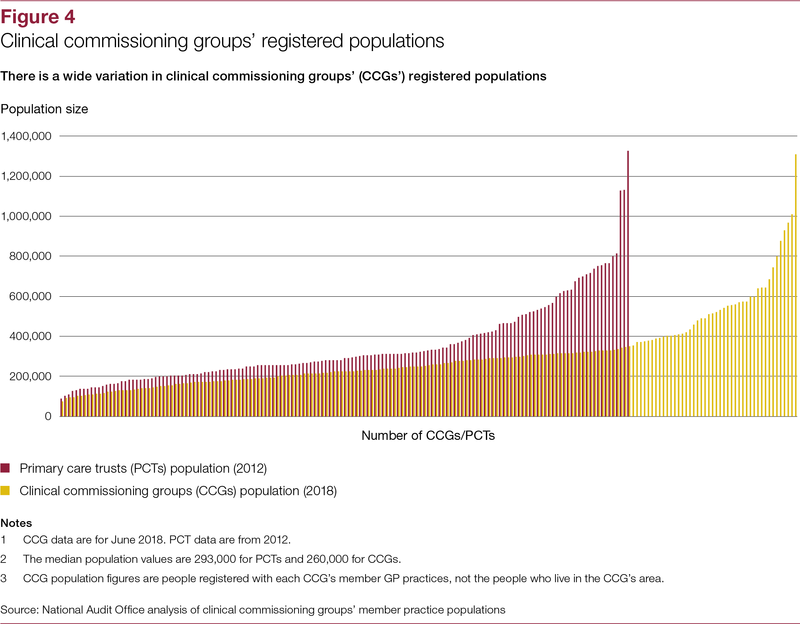 the changing commissioning landscape and the future role of CCGs. 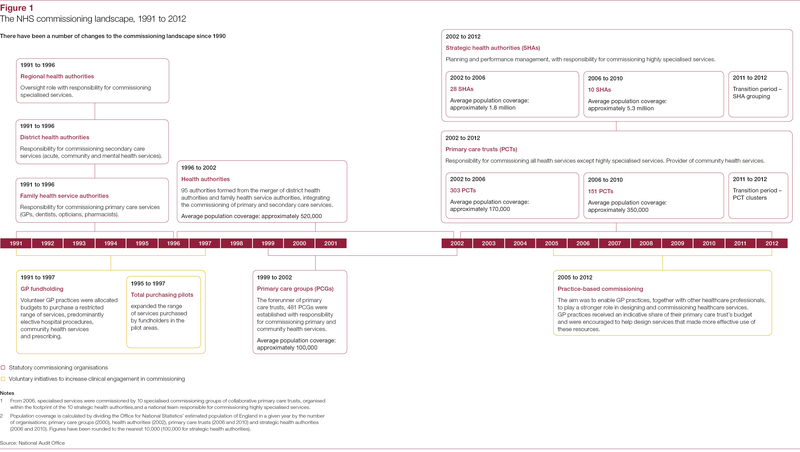 CCGs were created from the reorganisation in how healthcare services are commissioned in the NHS. They were designed to give more responsibility to clinicians to commission healthcare services for their communities and were given resources to do this. 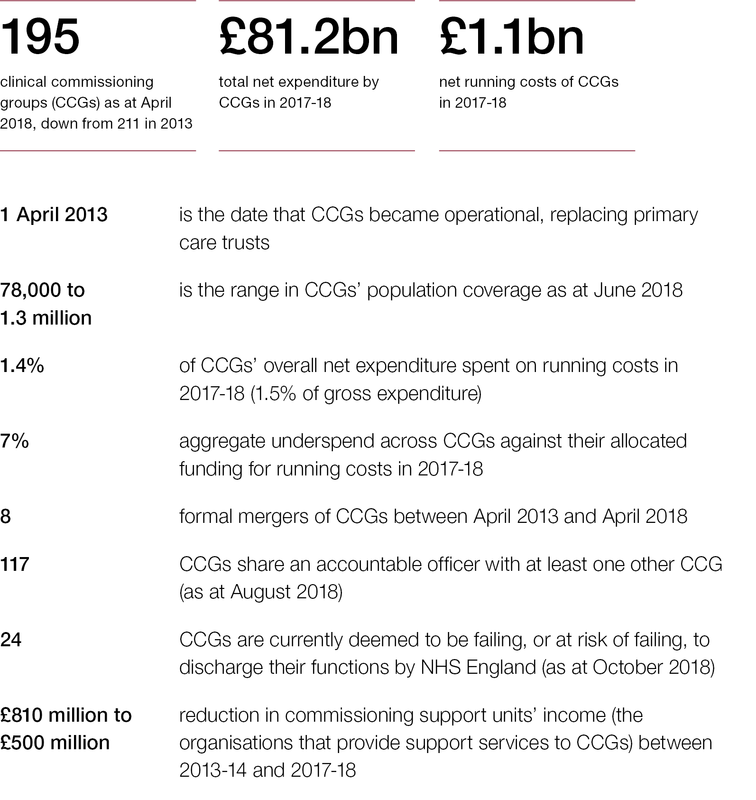 NHS England’s assessment of CCGs’ performance shows a mixed picture. 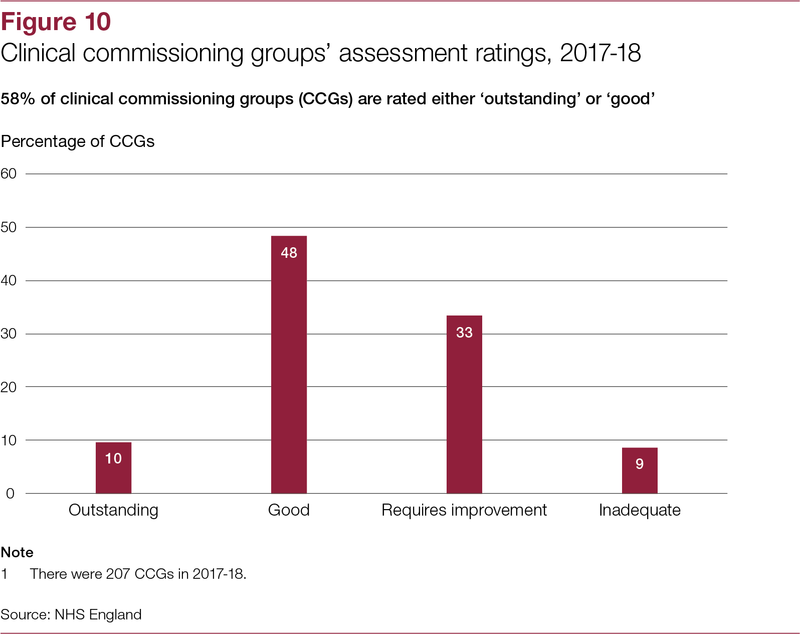 Over half of CCGs were rated either ‘outstanding’ or ‘good’, but 42% (87 of 207) are rated either ‘requires improvement’ or ‘inadequate’, with 24 deemed to be failing, or at risk of failing. 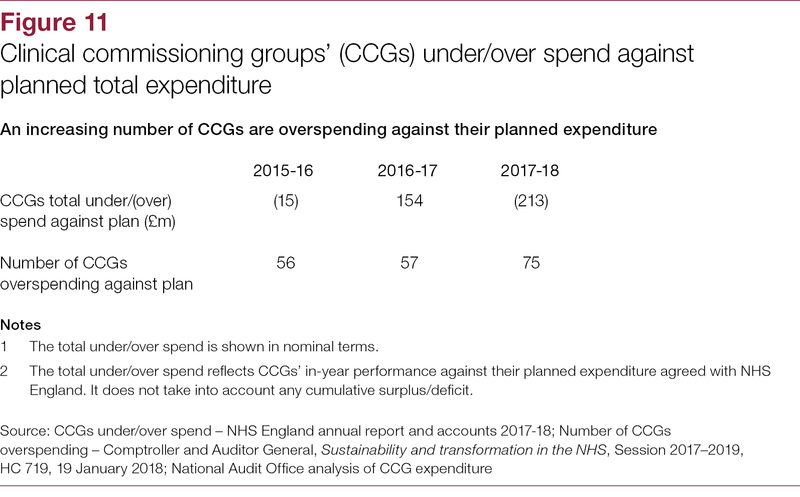 Many CCGs are struggling to operate within their planned expenditure limits despite remaining within their separate running cost allowance. Attracting and retaining high-quality leadership is an ongoing issue. There has been a phase of CCG restructuring with increased joint working and some CCGs merging. If current trends continue, this seems likely to result in fewer CCGs covering larger populations based around STP footprints. This larger scale is intended to help with planning, integrating services and consolidating CCGs’ leadership capability. 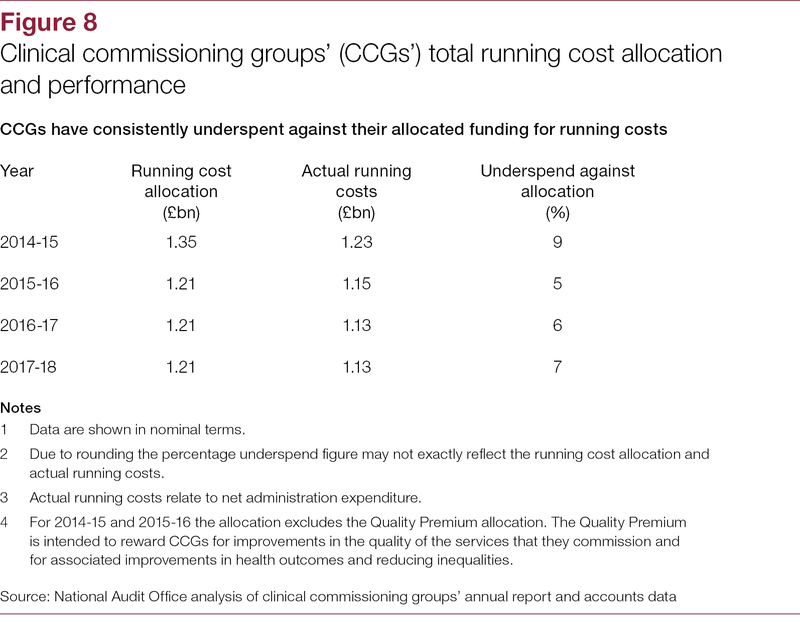 However, there is a risk that commissioning across a larger population will make it more difficult for CCGs to design local health services that are responsive to patients’ needs, one of the original objectives of CCGs. CCGs have the opportunity to take the lead in determining their new structures. NHS England is expected to set out its vision for NHS commissioning in its long-term plan for the NHS to be published in December 2018. 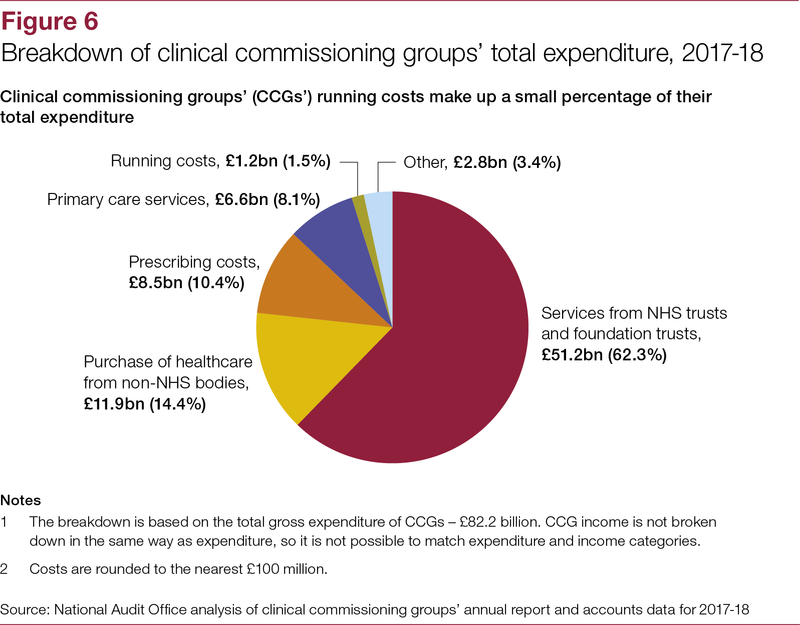 NHS England has said it will step in where CCGs diverge from its vision of effective commissioning. However, it has not set out fully the criteria it will use to determine when to step in. 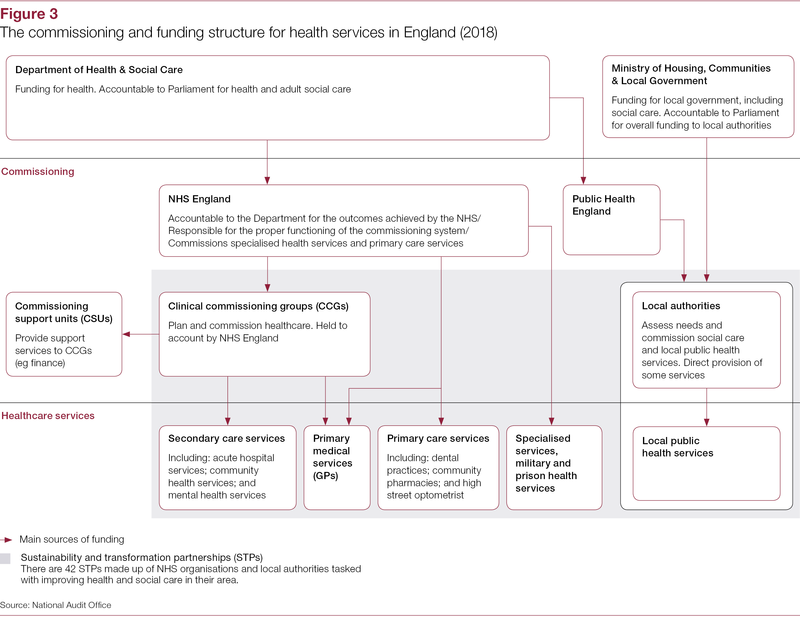 Our previous work on the NHS reforms brought in under the Health and Social Care Act 2012 highlighted the significant upheaval caused by major organisational restructuring. It is therefore important that the current restructuring of CCGs creates stable and effective organisations that support the long-term aims of the NHS. Following almost three decades of change, NHS commissioning needs a prolonged period of organisational stability. This would allow organisations to focus on transforming and integrating health and care services rather than on reorganising themselves. 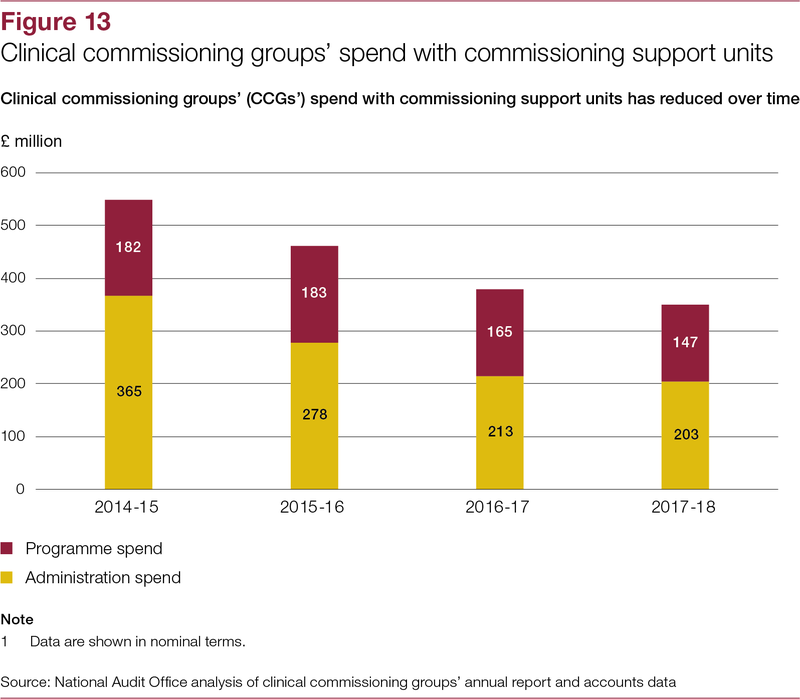 It would be a huge waste of resources and opportunity if, in five years’ time, NHS commissioning is going full circle and undergoing yet another cycle of restructuring.